Arthritis is a condition of the joints that can affect people of all ages. An estimated 50 million adults in the U.S. have some form of arthritis. If you are one of them, self-management can be a vital part of your treatment plan. 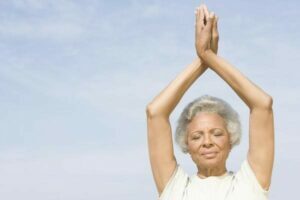 Though you will want to follow your doctor’s advice, you can do many things yourself to address the physical and emotional stress that arthritis puts on your life. It’s up to you to make positive changes and healthy choices so you can continue to live life the way you want to. Here are some great ways to get you started on your self-care journey. Adopt a good posture when sitting and standing. Take a lot of breaks and change position frequently! Stretch the area being affected by the movement. Pick up items from the floor by first bending your knees and hips and then stooping down. Or sit in a chair and bend over. Keep your hands below the “3 o’clock” and “9 o’clock” positions on the steering wheel when driving. Most people think of traditional exercise when we mention “staying mobile.” While this type of activity is a great way to improve joint health, just keeping your body moving in simple ways is also very effective. The idea is to find ways to prevent stiffness in the affected joints. Getting an evaluation from a physical therapist is a great way to determine the right types of mobile movements for your particular arthritis. Planning your day and arranging your home in a way that will avoid repetitive motions can help relieve some of your arthritis pain. For example, keep a basket at the bottom of the stairs that you can drop things into as the day goes on. Eventually, you can bring everything up in one easy trip! This will not only save you time but put less strain on your joints. Put frequently used items within a comfortable reaching distance at eye- or hip-level. Invite a friend over to help declutter your house, to minimize the need to bend down repeatedly. Cleaning up constantly or tripping over things can be avoided with good planning. Remember to give yourself plenty of time to get your daily routine accomplished. Rushing creates stress and more joint pain. Assistance devices provide you with independence and pain relief. Today, there are many products available to help with a variety of everyday activities. Here are some inexpensive and easy tools that you can order on Amazon: doorknob extenders, book holders to prop up books while reading, and pen grips to make them easier to hold while writing. Many household tools come in assistive varieties now as well. Consider getting a laundry basket with wheels, and use a small cart to carry heavy things around the house to take the excess strain off your joints. Managing your mental health is just as important as your physical health when you have an ongoing condition that affects every part of your life. Reducing stress and fatigue can decrease your symptoms and make you feel more positive about your life. Take personal time every day to ease your body and calm your mind. Some people prefer relaxation methods, such as yoga, while others just simply want to take a nap! Arthritis.org has a lot of stress relief ideas that we’d like to share with you. Some of them include meditation, tai chi, painting, swimming, and spending time chatting with close friends.